On Monday a 20-year-old California college student who was allegedly planning to join an Al Qaeda splinter group in Syria was arrested in Washington on an Amtrak bus headed for the Canadian border. According to a 23-page affidavit, Nicholas Teausant, a student at San Joaquin Delta Community College and member of the National Guard, told a confidential source that he planned to travel from Canada to Syria, where he would join the Islamic State of Iraq and Syria. 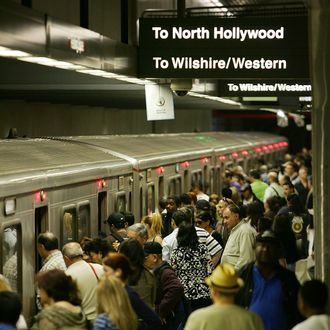 The complaint says he also hatched a plan with seven other people to target L.A.’s subway system around New Year’s Day, but the plot was abandoned over fears that the authorities had been “tipped off” – which, as turns out, were legitimate. “My designs have me staying [in Syria] and being on every news station in the world,” he reportedly told an FBI informant. “Like I want my face on FBI’s top 12 most wanted. Because that means I’m doing something right.” He sort of got his wish, but instead of gaining notoriety as an American in an Islamist militant group, every news outlet is reporting that he’s been charged with attempting to provide material support to a foreign terrorist organization, and is facing a maximum sentence of fifteen years and a fine of $250,000.